On Thursday, November 15, 2018, AAFSW held its 28th annual AAFSW awards program, which was presided over by AAFSW President, Dr. Joanna Athanasopoulos Owen, at the Benjamin Franklin Reception Room in the Department of State. The ceremony highlighted the exceptional volunteer work of seven remarkable individuals. 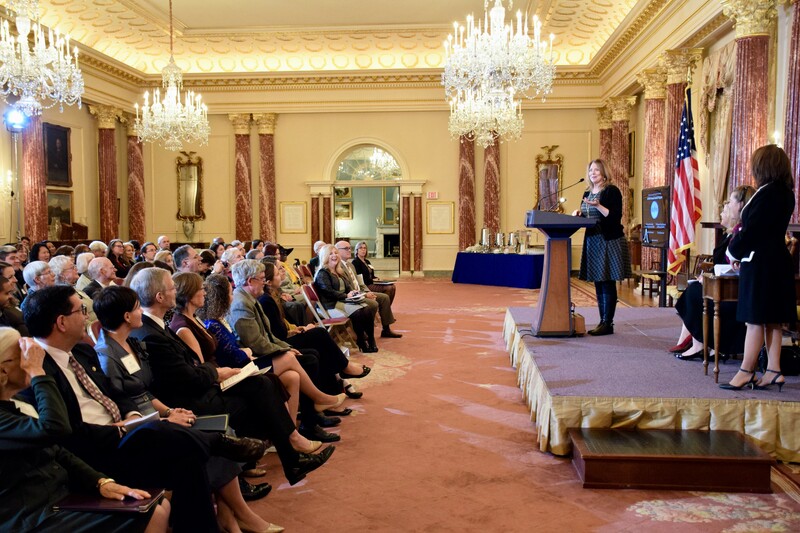 The Associates of the American Foreign Service Worldwide are grateful to have the continued financial support of former Secretary of State James Baker and his wife Mrs. Susan Baker, who helped establish this award in 1990 to recognize the goodwill of Americans for exceptional community service abroad, former Secretary of State Colin Powell, former Secretary of State George Shultz, the Ambassador Steven J. Green School of International and Public Affairs at Florida International University and the Green Family Foundation, as well as the support of the Center Family Foundation and the countless AAFSW members. This year, AAFSW recognized four winners for the Secretary of State Award for Outstanding Volunteerism Abroad (SOSA) from four different geographical bureaus. DACOR recognized the winner of the 2018 Tragen Award, AAFSW and the Champions of Career Enhancement for EFMs Employment Committee recognized the recipient of the 2018 CCE–EFM Award, and AAFSW recognized the winner of the 2018 Lesley Dorman Award. This was an exceptional year for our winners! Secretary of State Mike Pompeo honored AAFSW and the 2018 winners with a private meet and greet which took place the day before the 2018 AAFSW SOSA Ceremony. Indeed, in the afternoon of Wednesday, November 14, 2018, Secretary of State Pompeo met with the winners and discussed their interests which led them to initiate and complete their SOSA winning projects. The Associates of the American Foreign Service and AAFSW President Dr. Joanna Athanasopoulos Owen are deeply grateful for this special honor afforded to all of us by Secretary Pompeo. The Associates of the American Foreign Service Worldwide and AAFSW President were also very happy to welcome State Department Spokesperson Heather Nauert, who was the keynote speaker and honored the awardees with her presence at the ceremony. Spokesperson Nauert emphasized the importance of the families that support the FSOs working abroad and called upon three children to come to the stage and honor their mother, a 2018 SOSA recipient, on her volunteer activities. The SOSA winners received a certificate of gratitude for their inspiring contributions signed by Secretary Pompeo and AAFSW President, Dr. Joanna Athanasopoulos Owen. In addition, thanks to our generous donors, each of the SOSA winners received a cash award of $2,500 as well as a pin that reads “Outstanding Volunteer,” which commemorates the annual AAFSW Ceremony. AAFSW was honored to welcome Acting Deputy Assistant Secretary of Human Resources Jeanne Juliao to help hand out all the 2018 awards. The winners were chosen by their projects’ sustainability, scope and reach, change and impact, ingenuity, and leadership. This year’s SOSA winners were presented by Yolanda Macias-Cottrell, AAFSW SOSA Chair, and they include: Dr. Abigail Hankin-Wei (AFRICAN Bureau), who trained physicians in emergency care in Mozambique; Nicola Hill (EAST ASIA and PACIFIC Bureau,) who promoted women’s and gender issues through public outreach events in China; Matt Ellsworth (EUROPE and EURASIA Bureau), who created an extensive genealogical database in Cyprus; and Jessica McInerney (WESTERN HEMISPHERE and the AMERICAS Bureau), for setting a new library up from scratch in Mexico. Following the presentation of the 2018 Secretary of State Awards, Acting Deputy Assistant Secretary of Human Resources Jeanne Juliao and DACOR President Jim Benson presented the Eleanor Dodson Tragen Award. 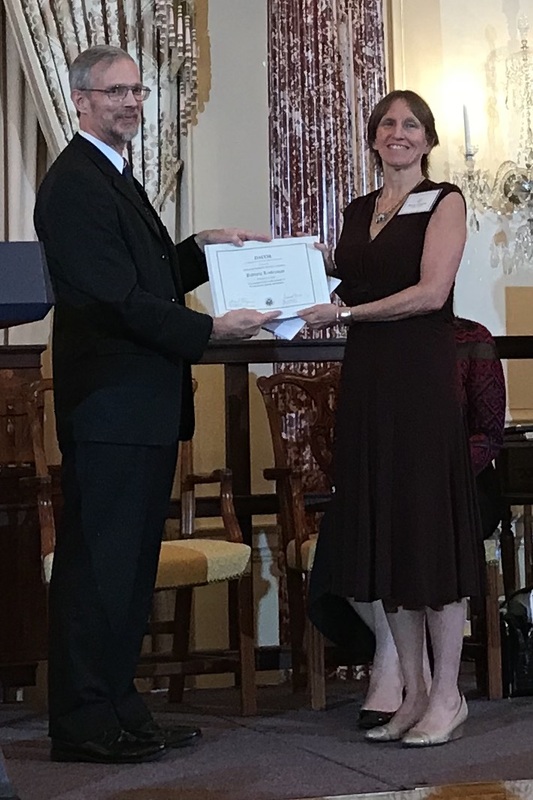 This recognition, which comes with a $2,000 cash award, is funded by an annual gift by Mr. Tragen in memory of his late wife and is administered by DACOR to recognize a member of the Foreign Service community who has effectively advocated for and enhanced the global rights and benefits of the Foreign Service family. AAFSW is extremely proud that this year’s award recipient is Patricia Linderman, AAFSW President Emerita. Throughout her 27 years as a Foreign Service family member, Patricia has contributed to efforts to share honest, candid information about Foreign Service life. She was a founding volunteer for Talesmag, which went online with the “Real Post Reports” in 1999, and she has helped moderate Foreign Service online groups such as Livelines and FSParent since the early 2000s. Patricia has co-edited several books: Realities of Foreign Service Life, Volumes 1 and 2, with royalties going to AAFSW, as well as A Cup of Culture and a Pinch of Crisis, a collection of essays about cross-cultural food experiences, which benefits the non-profit Tales from a Small Planet, www.talesmag.com. Seeing new online resources arising for the Foreign Service community but realizing that many people were unaware of them, she joined a volunteer team that created the Foreign Service Hub, www.FSHub.org, which gathers governmental, non-profit, and social media resources in a single site. Acting Deputy Assistant Secretary of Human Resources Jeanne Juliao, along with AAFSW President Dr. Joanna Athanasopoulos Owen and AAFSW EFM Employment Committee representative Bob Castro, presented the 2018 CCE-EFM Award to Laura Sheehan. This recognition comes with a $750 cash award provided by AAFSW, and it honors an individual who has been proactive in advancing Eligible Family Member Employment. Laura provided one-on-one career coaching to hundreds of EFMs in the East Asia Pacific region. Through the use of GEI-provided tools supplemented with her own materials and anecdotes, she helped EFMs define their career paths, craft resumes, hone their interview skills, negotiate salaries (and raises), and launch their own businesses. Most often, Laura is credited with helping build EFM confidence and improving morale. Laura’s clients often tell her that after talking to her, they feel like they have clarity on their next steps and they have a renewed sense of purpose. She took her encouraging messages to the wider expat community by launching a professional development group called “Empowering Perspectives,” speaking on a Thriving Abroad podcast in March 2018, and delivering a talk on “Career Change” at TEDx Hanoi 2018. Acting Deputy Assistant Secretary of Human Resources Jeanne Juliao, AAFSW State Liaison Dr. Mette Beecroft, and AAFSW President Dr. Joanna Athanasopoulos Owen presented the 2018 Lesley Dorman Award to Catherine Pierce. Lesley Dorman, who was a former AAFSW President, passed away on August 19, 2016. This award recognizes an AAFSW member who has performed outstanding service in all aspects of the organization and comes together with a silver-plated engraved platter. Together with Patricia Linderman, Catherine has been involved in the development and marketing of the FSHub.org portal since its inception in 2016, and has been the AAFSW EFM Employment Chair since the fall of 2017, a strong advocate of a fairer EPAP selection system in 2018. She has also volunteered for many AAFSW activities during her stay in Washington, DC from 2016 to 2018 and is a long-standing member of the AAFSW French Conversation Group. Catherine has been in Beijing, China since August 2018, so she was unable to travel and receive her award personally at the 2018 AAFSW Awards Ceremony. AAFSW member Christel McDonald accepted the 2018 Lesley Dorman Award on Catherine’s behalf. Last but certainly not least, AAFSW Honorary President Susan Pompeo addressed the 2018 winners and AAFSW guests and members with a heartwarming speech on the importance of volunteerism to the communities in which people live permanently or temporarily. AAFSW really appreciated Mrs. Pompeo’s remarks as she mentioned her efforts as a volunteer and the significance of the amazing volunteer contributions of the American diplomatic community abroad. The Associates of the American Foreign Service Worldwide would like to thank Secretary Mike Pompeo, AAFSW Honorary President Susan Pompeo as well as all our distinguished guests who were present at the 2018 AAFSW Awards Ceremony, especially State Department Spokesperson Heather Nauert and Acting Deputy Assistant Secretary of Human Resources Jeanne Juliao. AAFSW would also like to thank our generous donors, the Regional Bureaus, the Family Liaison Office, DACOR, the SOSA Committee, the AAFSW Board, the AAFSW members and volunteers, and the AAFSW Foreign Born Spouses members for their continued support of our annual AAFSW Awards Program. As the AAFSW President, I would personally like to thank our AAFSW State Liaison Dr. Mette Beecroft, our AAFSW Program Chair Sheila Switzer, our AAFSW SOSA Chair Yolanda Macias-Cottrell, and our AAFSW Office Manager Barbara Reioux for their boundless support and relentless determination to perfection.